Local resident Shree Krishna Majhi in front of a confined masonry model house in Bhimtar, Sindhupalchok district, Nepal. Shree Krishna Majhi is a local resident of Bhimtar village, located in the Sindhupalchok District of Nepal. Sindhupalchowk was one of the most heavily affected districts following the 2015 earthquakes that devastated Nepal. Most of the houses in Bhimtar were either heavily damaged or completely destroyed in the disaster. People were forced to live in temporary shelters made of metal sheets for months. 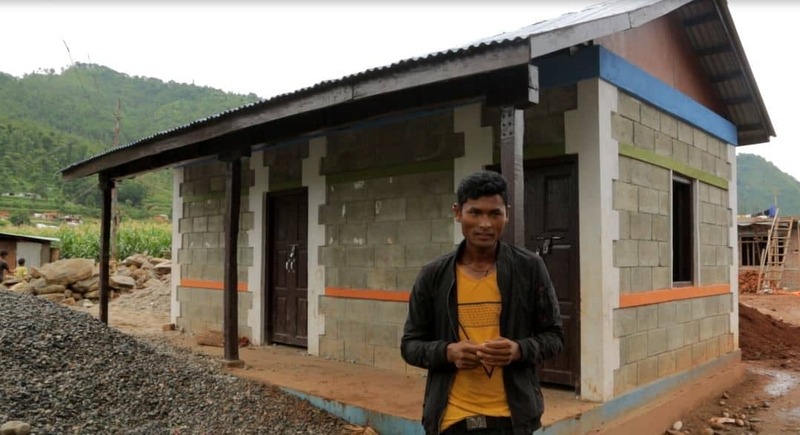 Bhimtar is a Majhi community, one of the marginalized communities in Nepal, and the residents had neither the financial resources nor the technical knowledge to rebuild their homes safer than they were before. Shree Krishna was one of the first homeowners in Bhimtar to receive on-the-job training (OJT) on confined masonry from Build Change and our local implementing partner ARSOW in collaboration with World Vision International (WVIN). Confined masonry is a cost-effective and earthquake-resistant building technique, in which the hollow concrete block walls are confined by reinforced concrete beams and columns on all four sides. This technique is relatively unknown in Nepal so a confined masonry model house was built in Bhimtar to raise community awareness about using the technique to rebuild. Shree Krishna was involved in the construction process of the model house (as seen in the photo above). In addition, Shree Krishna was trained on how to produce hollow concrete blocks at a locally established production site. Quality blocks are an important component of confined masonry houses and Build Change provided training to local homeowners on quality block production as part of the awareness. This also helped create local employment and income in the community.